Welcome to the home page for the Choralyre music folder. 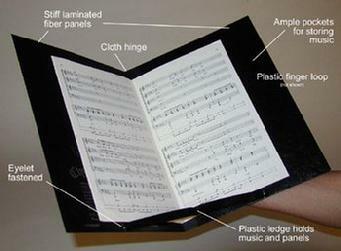 This is the original choral music folder produced since 1954 and used by choirs around the world. - the CHORALYRE - a unique music "rack" to hold octavo music for your choral singers. Plastic ledge holds panels open to ideal position. Other hand is always free to turn the music pages. Music sheets can be rearranged or removed instantly. It is sturdy enough to carry an oratorio book or hymnal. Two inside pockets provide for storing up to 25 pieces of octavo music. Plastic ledge holds stack of music in CHORALYRE securely without the use of fastenings. Loop slips over fingers and holds CHORALYRE securely yet comfortably to one hand. Best of all, the singer can give full attention to the director - no distractions. Copyright © 2017 The Choralyre Company. All Rights Reserved.